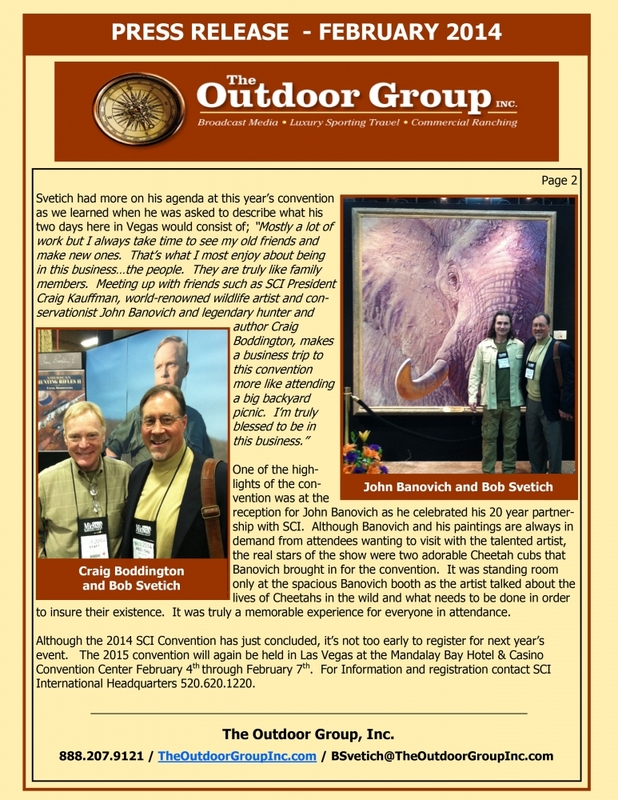 The Outdoor Group, Inc. was represented at this year’s convention by the company’s Chairman/CEO Bob Svetich. Svetich had more on his agenda at this year’s convention as we learned when he was asked to describe what his two days here in Vegas would consist of; “Mostly a lot of work but I always take time to see my old friends and make new ones. That’s what I most enjoy about being in this business…the people. They are truly like family members. Meeting up with friends such as SCI President Craig Kauffman, world-renowned wildlife artist and conservationist John Banovich and legendary hunter and author Craig Boddington, makes a business trip to this convention more like attending a big backyard picnic. I’m truly blessed to be in this business.” One of the highlights of the convention was at the reception for John Banovich as he celebrated his 20 year partnership with SCI. Although Banovich and his paintings are always in demand from attendees wanting to visit with the talented artist, the real stars of the show were two adorable Cheetah cubs that Banovich brought in for the convention. It was standing room only at the spacious Banovich booth as the artist talked about the lives of Cheetahs in the wild and what needs to be done in order to insure their existence. It was truly a memorable experience for everyone in attendance.